During a planetary nebula confirmation mission, we were able to use a LISA spectrograph on a 1m telescope, the T1m “Epsilon” of the C2PU. 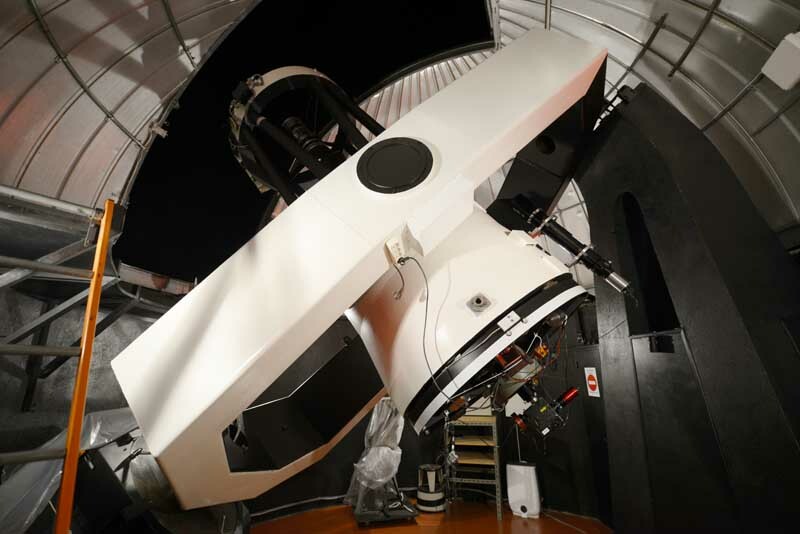 The C2PU has 2 twin telescopes. One is named Omicron (West dome) and the other Epsilon (East dome). Each telescope is mounted on a Yoke equatorial fork mount. They are located on the plateau of Calern near Nice in south of France and managed by the observatory of the Côte d’Azur. Since the 1 meter telescope is natively at F/D 12.5, two focal reducers are used to change the F/D ratio down to a value close to 7. 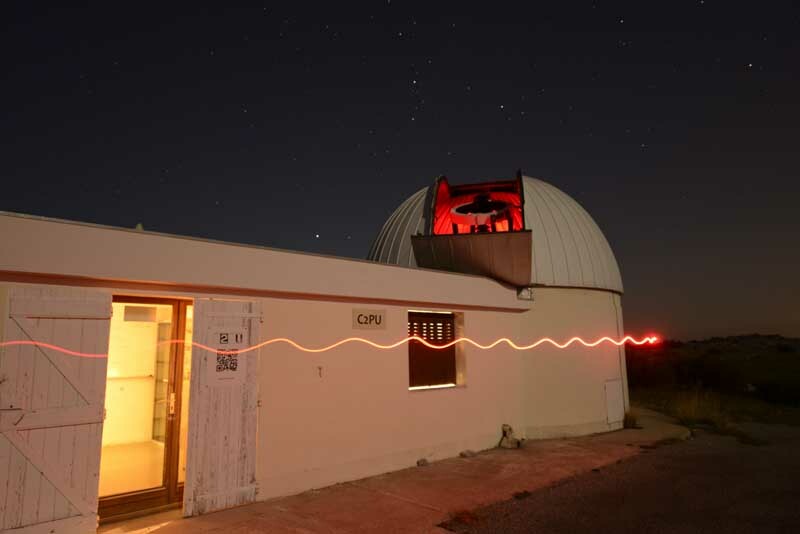 The first one used is the one from the C2PU, usually dedicated to this telescope. The second is a Astro-Physics CCDT67 focal reducer. An ATIK 314L+ for the autoguiding which allows to have a rather wide field. This field makes it possible to check the centering of the target on the slit of the spectrograph and to ensure the autoguiding on a star close to the slit. This camera is used in 2x2 binning. An important change on the LISA is made in order to optimize the chances of obtaining the signal on these very weak targets:we used a 50 μm slit, the flux is thus more important at the expense of the resolution . The resolving power of LISA goes down from R = 1000 to R = 500 approximately. Finally, the LISA calibration lamps (Tungsten and Neon) are remotely controlled to prevent any intrusion into the dome. (We could have used the SPOX module for this but at the time of the mission, this module was not yet available). 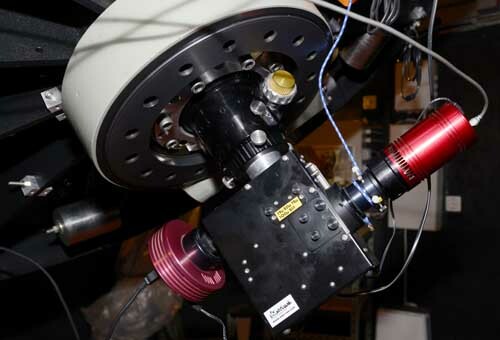 Both cameras are oriented to obtain a horizontal slit (for the autoguiding CCD) and a horizontal spectrum (for the CCD “science”). The field of the autoguiding camera is oriented with the North at the top so as to facilitate field reconnaissance. The spectrograph remains permanently on the telescope throughout the mission. 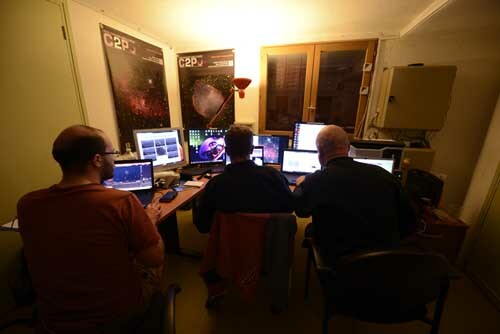 The targets that we observed being very weak, it is necessary to be able to guide on a close star while keeping the target in the slit of the spectrograph. Once the pointing is completed, an image of the autoguiding sensor field is made. This image makes possible to attest to the good centering of the target in the slit. 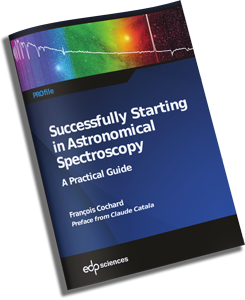 In addition to the target, it is also necessary to take a spectrum of a close reference star, which can be easily chosen thanks to the spreadsheet provided by François Teyssier. downloading here. The wavelength calibration of the spectrum using the Balmer lines of the star (they complement the lines provided by the Neon lamp). The correction of the raw spectrum of the instrumental response and the air mass by comparing it with the reference spectrum produced outside the earth’s atmosphere. 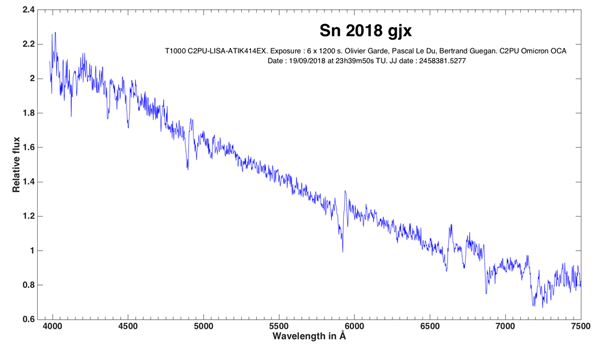 Magnitude 16.9 at the moment when its spectrum was obtained on September 19, 2018 with 6 exposures of 1200s. The spectrum shows Hα et Hβ line in emission. 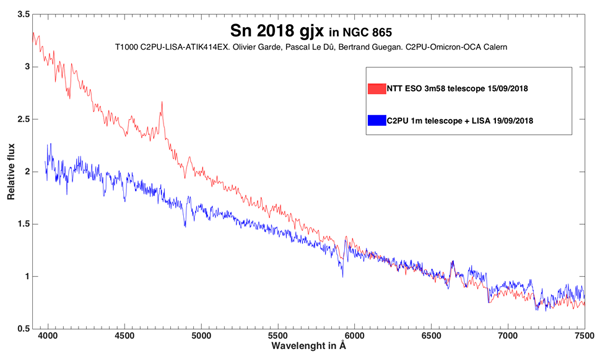 It was compared with a spectrum taken 4 days ago (September 15) with the NTT telescope 3m58 at La Silla in Chile. The two results are quite similar with of course a less noisy spectrum for that performed on the NTT. 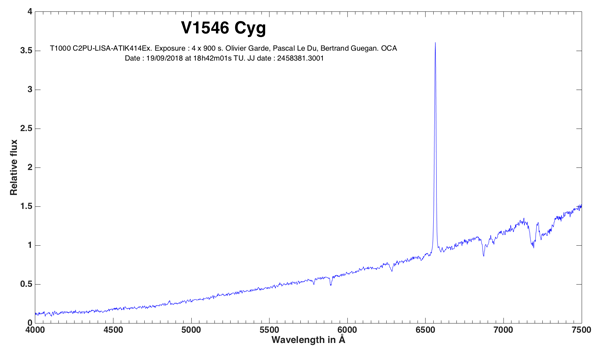 These 2 spectra also show that the spectral profile evolved significantly in 4 days. The third weakest star in BeSS spectral database and who had no spectrum at the time of the mission. Here, the exposure time was 6 x 900s. 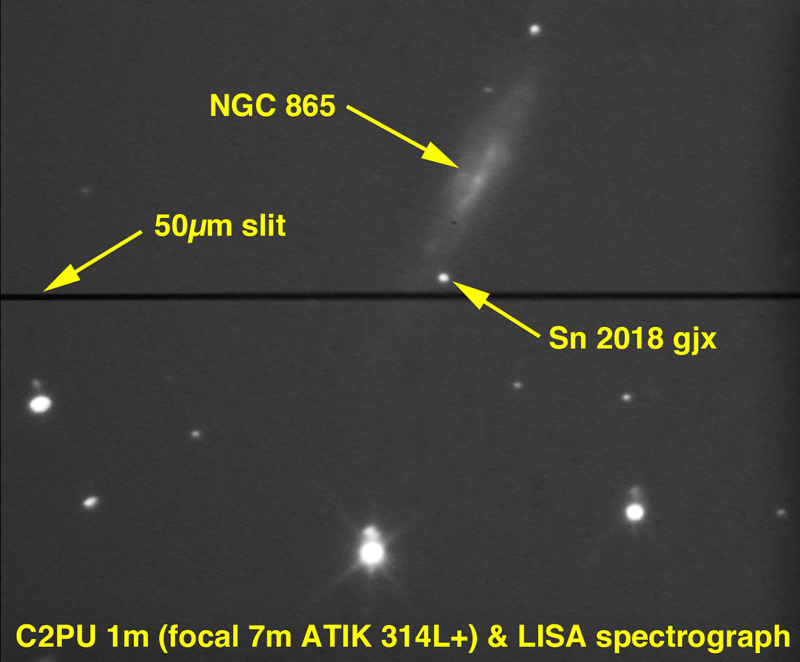 It was demonstrated during this mission that a LISA spectrograph could be used on a large diameter telescope, while taking the precaution of using a 50μm slit because of the focal length of the telescope. In this kind of configuration the SPOX module would have been of great help to remotely control the calibration and flat lamps of the spectrograph (here the lamps were controlled using an wireless remote control). The magnitude 17 is here obtained with “reasonable” exposure times to obtain a signal-to-noise ratio close to 100.